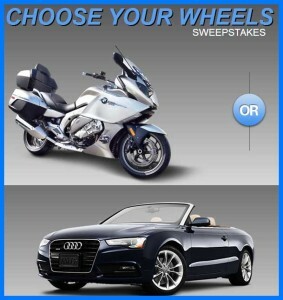 Enter to win an Audi A5 or BMW motorcycle. The eBay ‘Choose Your Wheels’ giveaway gives you the chance to choose between two awesome but very different sets of wheels. The one grand prize winner will get a choice of a 2013 BMW K 1600 GTL (1649cc Oil/Watercooled 4-stroke in-line 6-cylinder) plus a $7,500 Motors shopping spree, Value of this prize is approx ($24,000) OR a 2014 Audi A5 Cabriolet (2.0 Liter 4-cylinder, 16 value DOHC with valve lift system), value of this prize is approx $45,000. In addition to the grand prize there is also daily sweepstakes winner. One daily prize will be given for 29 days and the winners will receive $50 eBay Gift Card. 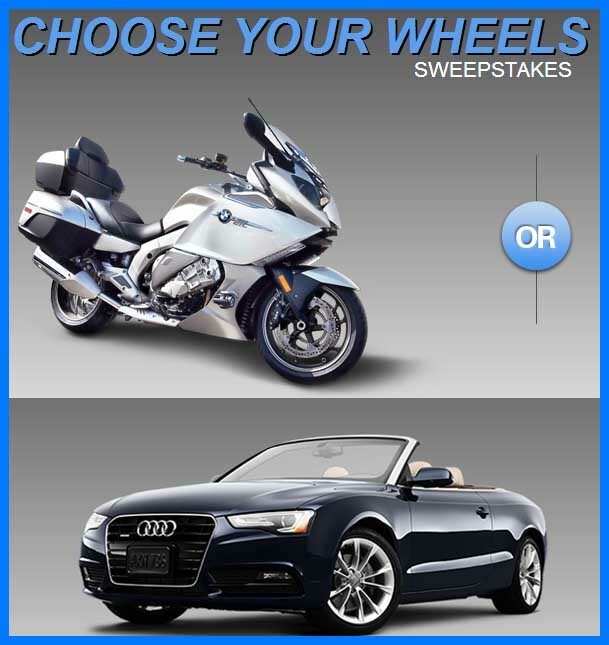 Do not miss out on this awesome free car sweepstakes, and make sure you enter before the closing date of September 30th, 2013. 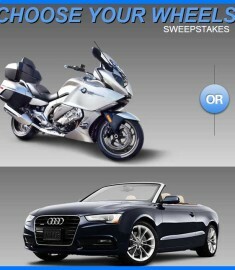 To win an Audi A5 or BMW motorcycle is a high end sweepstakes and can make you the envy of all your friends. Whether you prefer 4 wheels or 2, this free car giveaway will suit you! I love a car sweepstakes, who wouldn’t want a new set of wheels. Is your car falling apart or just embarrassingly uncool or old. Audi and BMW are the epitome of German engineering at its best. You have gotta love German cars for their beauty, performance and durability. When you drive and Audi or a BMW it truly makes a statement about you, people notice! If they don’t notice how cool your wheels look, then they will soon here the purr of the amazing engine. There is a slight rivarly between the Audi and BMW, where do you stand on this issue? Which of these two supreme German car brands do you think is the best? I want the A5 pleash.